You’ve heard about it, you’ve read about it, you’ve seen it on color TV, you’ve even seen it streamed. The cover story in this month’s issue of ChemMedChem is a communication by members and collaborators of the Robert Doyle Group here at Syracuse University. The report describes the B12/TCII-based uptake of insulin, a process that occurs via the ingestion of a B12-insulin conjugate. In case you missed that, the delivery is oral, not by needle. For those of us that pass out at anything needle-related at about the time that the alcohol wipe is opened, that’s a positive step forward for getting rid of any syringe-related medicine altogether. With the cover story comes the cover image shown above, a structure calculation on the insulin-B12/TCII complex. The bases for this structure can be found in the Protein Data Bank, including the TCII-B12 complex reported in PDB entry 2BB5 (the only hack in the structure calculation involved the replacement of the cobalt for iron to use already available bond parameters) and the insulin structure reported in PDB entry 1ZNI. The covalent attachment of the insulin to B12 can be found in the article. 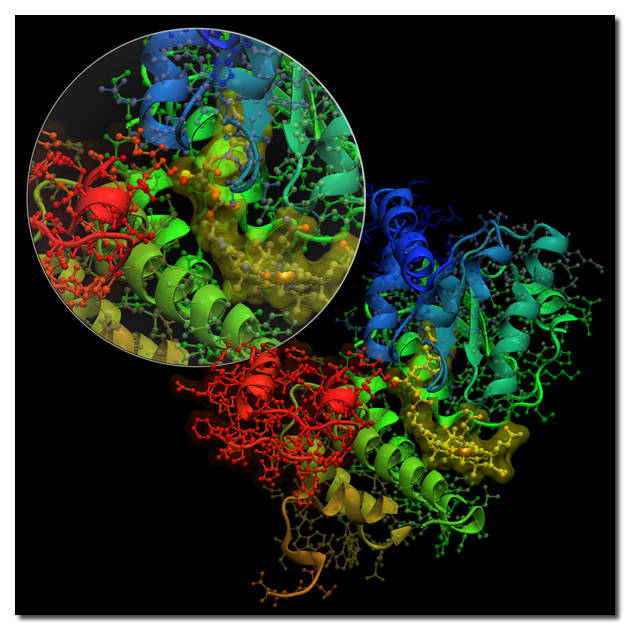 Structure manipulation was performed with a combination of NanoEngineer-1 and VMD, VMD being included in the mix in order to generate the ribbon renderings of the insulin and TCII protein backbones. As for the accuracy of the calculation, time and a synchrotron X-ray source will tell. For much more information and numerous links to new stories related to the research in the article, I direct you to the group website of Robert Doyle and the various links to news stories available in his departmental publication list. From ChemMedChem. Click HERE to go to the article. 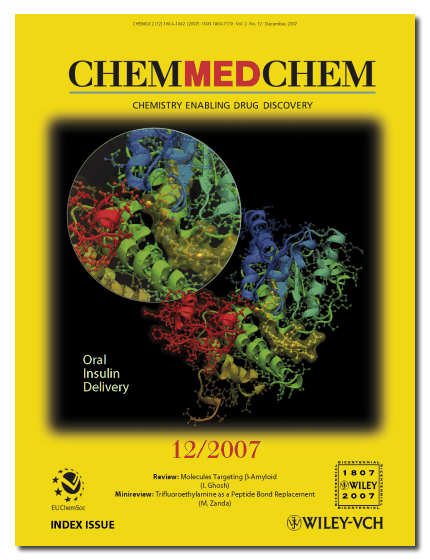 Cover Picture: Vitamin B12 as a Carrier for the Oral Delivery of Insulin (ChemMedChem 12/2007). The cover picture shows an orally active, glucose-lowering vitamin B12-insulin conjugate bound to the B12 uptake protein transcobalamin II (TCII). The inset shows a close-up view of the TCII binding pocket. (Insulin is in red; vitamin B12 is in bright yellow.) For details, see the Communication by T. J. Fairchild, R. P. Doyle, et al. on p. 1717 ff. Previous PostPrevious From Kudos To Credit Cards For Qubits!